All the qualities of a great business gift: unique, hand made in Seattle, affordable, customizable in your colors, and gift boxed. 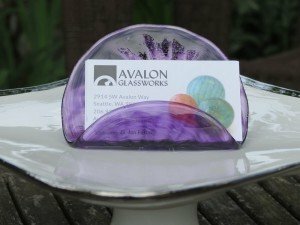 Our hand blown glass business card holder measures approximately 4″ wide x 3″ tall and hold about 20 cards. Can also be used to hold place cards, photos, or recipes. Order below or contact us for custom colors or bulk orders.